Calling all junior astronauts - gear up for your mission with mini space suits! Calling all junior astronauts – gear up for your mission with mini space suits! The sky is the limit when it comes to prospective careers as a preschooler. If you have a wannabe astronaut on your hands, you can make his or her year with this awesome costume! The Jr. Astronaut Suit is a fantastic replica of the real deal spacesuits worn by actual astronauts on their space missions. Designed to fit children aged four to six, trying to resist a moon walk action will be futile while wearing this bright white costume. As you can see, no detail goes unnoticed, from the velcro ankle strap fastenings to the awesome NASA embroidered commander patches on the front, There’s even a matching NASA embroidered cap. 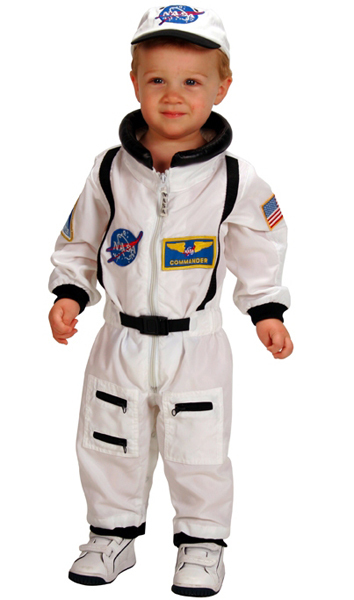 Be quick to snap up the Jr. Astronaut Suit for your child’s next space mission, priced £45 from Science Museum. A reshipper will need to be sourced for Australian delivery.